How was 2008? Despite the economy, I hope it was a good year for you. Thank you for reading our adventures. Though I have not met most of you, your comments and e-mails brighten my days. I look forward to more new adventures in the kitchen, as well as travelling around Japan in the New Year. May 2009 bring happiness, good health and prosperity to you. Today we are doing our O-soji. This is a fun meme, for all the items you have done, bold it. I combined some items from the Australian list as well as the American one. I also added some of my own items. If you do this meme, link back to this post. I wanted to tell you about something that many won't tell you about...hesokuri. Hesokuri is pin money in Japanese. Many wives keep a hesokuri some running into the thousands. When we were burglarized, one of the things that was taken was my hesokuri. I had actually had some money set aside in my emergency earthquake bag. The first thing the police asked me when I told them what was taken, "can you tell us in front of your husband how much was taken?" You may be wondering why they would ask this...Many wives keep their hesokuri secret from their husbands. In most Japanese homes, the wives hold the purse strings. Unlike the States, most salaries are paid monthly. The husbands turnover their paychecks to their wives and the wives give their husbands kozukai (an allowance). The rest of the money is used to pay bills, the mortgage and everyday living expenses. Any money that is left, sometimes "finds its way" into the hesokuri. This amount that the husband receives as kozukai is often the topic of some news stories. I think this year the going kozukai rate was like 30,000 yen (about US$300). Anyway, my hesokuri does not come from the money I get from Satoshi (who holds the purse strings in our household), but from my lessons. Usually every month, I usually put some of the money into the bank and then keep some money aside to use or for emergency. Some things I have used my hesokuri for: something for Christmas for Satoshi, candies for the children at our annual Christmas party, books, a few foodie adventures and more recently, the giveaway. For Christmas, I bought myself this book with my hesokuri, "The Food You Crave" by Ellie Krieger. I love her recipes, they are relatively simple and very healthy. One recipe in the book was a pesto potato salad. Since this recipe is meant to be served cold, I changed it to a pesto mashed potato so I could serve it warm. I served this with a pan fried boneless pork chop and onions sauteed with apricot jam and a little ketchup. Do you keep pin money? What do you use it for? The highs have been quite low...10C-12C (50F-53F), the lows have been really low 0C-4C(32F-39F), while we had some sleet, Kyoto had some snow. Yesterday, Oahu had a major power outage, Satoshi had to work overtime since many flights were delayed going to Hawaii. He also went to work this morning to check on things. I noticed I had some photos that I hadn't posted about, so I wanted to tell you about what I've been eating recently...I made a stir fry with sweet potato, mushrooms, carrots, green beans and kim chee...simply delicious. Recently at Anri, I have been addicted to these french breads with beef stew in them. The bread is the size of a fist and there is beef stew and a little cheese. Another version of this is with chunky potato salad in it...also addicting. Recently I made a kinpira using gobo (burdock), carrot & sweet potato. I had some leftover soup from making udon, so after stir frying the veggies in some oil, I added the soup, a little sugar, some sesame oil. Since I couldn't find my chili flakes, I sprinkled some chipotle flakes....It was delicious. Recently at Starbucks I tried their Dark Chocolate Cherry Mocha and their chocolate biscotti...meh...too much fake cherry flavor in the mocha and the biscotti was just so-so. On another trip to Starbucks, I tried their plain biscotti with the Chocolate truffle cocoa. I liked this biscotti better, there were lots of almonds and bits of chocolate in it. Recently, there was saikyozuke saba. Saikyozuke is when fish is soaked in Kyoto white miso. Before baking in the oven, you need to wipe some of the miso off (to prevent it from burning). Though, even if I wiped the miso off, it still burned. At least it was only the skin of the fish that burned. Recently I made some fajitas using only veggies and the mexican lime olive oil....delicious. It is bonenkai season here. Bonenkai literally means "forget the year" party. To me, it is just an excuse for businessmen and women to get together and drink, most times to the point until they can't remember anything. Though if you ask me, no year could be so bad that you need to drink yourself into a stupor. Oh, and then at the beginning of the year, is the shin-nenkai or New Year party. This is when they again get themselves together to drink themselves into another stupor to get ready to work themselves silly for the next 12 months...I bet the hangovers aren't something they'd like to remember. Thank you for your Christmas wishes. Satoshi was able to take the day off so we spent the day together. (Christmas is not a national holiday here, so if it falls on a weekday, most times Satoshi has to work--I think this was the first time in 7 years of living here that he was able to take the day off.) To our family and friends, we appreciate all of your cards and gifts. This Christmas was rainy and cold. I was hoping to see some flurries but there were none to be seen. We had our annual Christmas party on the 23rd with two other families. I brought two cream cheese dips. One with smoked salmon and one with roasted garlic and served them with Ritz crackers. It was a nice gathering and nice to see our friend's children who are getting bigger each year. Our Christmas dinner last night was a pupu (appetizer) party. I made a version of Deb's ahi, avocado, crab towers. For some reason, the market didn't have maguro today, so I subbed salmon cut for sushi. I did it a bit chunky but it was still delicious. We also had slices of apple with smoked cheddar. There was also some chips and a glass of Two Oceans pinotage, a South African wine. Dessert was chocolate dipped strawberries. Recently, I bought a fondue pot by Vanilla Patisserie, which I found out is a shop in England. DHC, which I have written about before, was selling these pots in dark 70%, milk with hazelnut and white at an introductory price of 800 yen (about US$8). Of course, I bought the 70%. Just warm up the pot in some hot water for about 10-15 minutes and you are good to go. Despite the rain, it was a great day. We hope you had a Merry Christmas and were able to enjoy it with family and friends. I recently saw Ariela's apple cobbler recipe on her blog and since we still had some apples, I wanted to try it. Of course, I still don't have a lot of butter around, so I improvised. I sauteed the apples with a pat of butter, a little sugar, cinnamon and nutmeg. Then I put together the easy scone recipe which I often use and put that on top of the apples to bake. I think if I had had some vanilla ice cream it would have been perfect....it was delicious and a great way to warm up. With a slice of apple, I also had a little snack, I cut a thin slice of smoked cheddar and ate it with the apple. Growing up, I would often have a slice of cheese and some peanut butter with apple. I didn't put any peanut butter, this version was a little saltier, but still delicious. Kanpai !(cheers!) it is a holiday here--the Emperor's birthday. This was a canned chu-hai (a highball made with shochu (an alcohol made with rice, potatoes, wheat or barley and diluted with soda water) This chu-hai was flavored with niju-iseki (which means 21st century, is a pear famous in the Tottori region) that we brought back with us. It was sweet and had a lot of fizz...it was delicious. The Seishun-18 (say shoon joo hachi kip-pu), is a great way for 5 friends to travel for a day or for a single person to travel for 5 days or for two people to travel for 2 days. The ticket costs 11500 yen (about US$115) and are only valid between different times during the year. 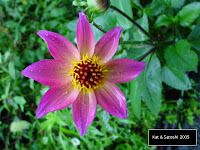 Spring (March 1 to April 10), Summer (July 20-September 10), Winter (December 10-January 20). The validity usually avoids peak travel periods. The day you use the ticket, you will get stamped and can use the ticket until midnight of the date that is stamped, getting an early start is a great way to make the most of the ticket. You can also get on and off the train, so it is a great way to explore many areas. The only downside to this ticket is that you cannot ride the Shinkansen nor can you ride a train car with reserved seats. The Japan Rail Pass is still the best buy for foreigners travelling in Japan because you can ride the Shinkansen and any JR train or JR bus for 7 or 14 days, depending on which pass you buy. Satoshi and I used this ticket to go to Tottori this past weekend. Tottori is located on the San-in coast of the Japan Sea. It took us about 6 hours to get from Osaka to Tottori riding various trains. It was definitely a long ride, but we were able to enjoy the scenery and take several naps. The most famous attraction is the sand dunes. It was amazing, all that sand! Higher than some buildings. 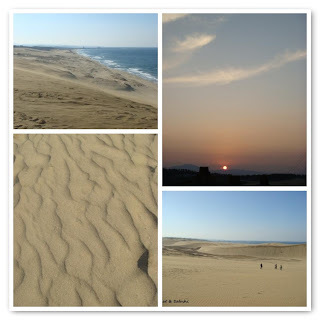 The dunes were located about a 20 minute bus ride (360 yen (about US$3.60 per person)) from the JR Tottori station. Coming from Hawaii, it was a weird feeling, seeing all that sand and seeing all the people bundled up in warm jackets. We stayed at the Hotel Tottori Sakyu Center. (Sakyu means dunes) This is located right next to the lift to the dunes. 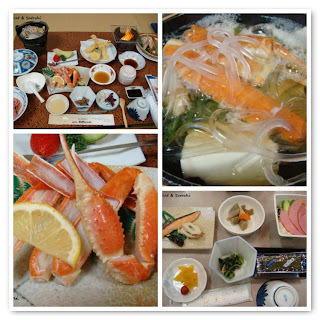 8400 yen per person with dinner and breakfast (about US$84). Next to the Sakyu Center, there was a Sand Museum. For 300 yen (about US$3) a person, you could go in to see awesome sand sculptures. This was the 2nd year for them to hold this event and the theme was Asian world heritage sites. We went once during the day and then again at night to see the sculptures lit up. It was amazing and we couldn't believe that they were only built from sand. 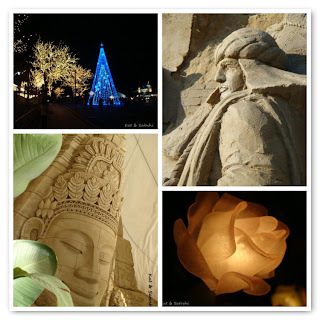 From the sand museum, near the dunes, the town had an illumination area for Christmas. It was nice to see all those lights. Dinner was CRAB! The area is famous for different types of crab. We figured that our dinner had about 1.5 whole crabs (bodies, legs, pinchers)... they had crab on the grill, crab in a hot pot, boiled crab....and on top of that there was sashimi, simmered fish, noodles, and fruit. Usually Satoshi helps me eat what I can't finish, but he was too stuffed! Breakfast the next day, was modest but still filling. Besides crab, Tottori is also known for tofu chikuwa, this is fish based like kamaboko but is made on a cylinder and this version had tofu added to it. 250 yen (about US$2.50). They are also known for rakkyo (pickled shallots), I'll post about them when we open our package. On our way back to the station, we spotted a wagashi (Japanese confection) shop called Amamiya and bought some sweets. 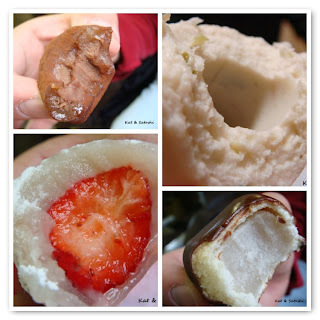 Choco mochi (soft rice cake filled with chocolate ganache) 80 yen each (about US$.80), ichigo daifuku (soft rice cake with a strawberry and some white bean paste wrapped around the strawberry) 100 yen each (about US$1) and a chocolate manju (a white bean paste manju covered with milk chocolate) 60 yen each (about US$.60)...everything was delicious and gone within minutes. It was a great weekend trip, a little long with the ride, but definitely a nice time to talk and relax. From the JR Tottori station, ride the bus from #0 bus area to the dunes, get off at the Sakyu Center stop. We just spent the weekend in Tottori, be back to tell you all about it! The other day, Tamakikat sent me a box of goodies and everything she included was a product of Kyoto. There was chigomochi from Wakasaya, chocolate marron from Hayashi Manshodo & kuromame (black bean) tea from Kaneido. The chigomochi was very soft and was dusted with a "glass-like" sugar. It wasn't sweet but was delicious. The chocolate marron are freeze-dried chestnuts covered in chocolate. The texture reminded me of Whoppers...these are addicting. And the kuromame tea is great for the environment. These roasted black beans are quite hard and can be eaten as is, but you put a tablespoon or two into hot water and wait 2 minutes. A deep purple-blackish liquid is formed, this is the "tea". Drink the tea and then sprinkle the reconstituted beans with some salt and eat....no mess or garbage to throw out. Out of all these gifts, the best gift from Tamakikat is her friendship, thanks Tamakikat for a great year of foodie adventures and conversations! I've been "reading" this Japanese book on tea time in Europe. 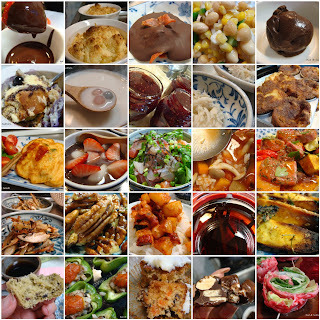 The author visited several European countries over 10 years and talks about her observations as well as the different tableware and food items for each of the countries that she visited. The thing I love about this book is that the photos are beautifully taken and there isn't too much narrative....why? One thing when I "read" Japanese books is that I usually need to look up kanji (Chinese characters) that I'm not familiar with (and that is usually a LOT). I usually take out my kanji dictionary, a Japanese-English dictionary and I also write down the kanji that I don't know into a notebook. (I have had this kanji dictionary as well as the Japanese-English dictionary since college.) If I don't have a lot to look up, I usually write the kanji and meaning in the margin of the book. By writing down the kanji in a notebook, as I am "reading", I can look back at the words I have looked up and it usually helps me "read" the rest of the book a little more easily. As you can tell, since it takes so much effort, I don't usually "read" a lot of Japanese books. So, I was reading the chapter on Holland and the author talked about warming caramel waffles (stroopwafel) on top of her mug. (Man, I wish I knew about this when Satoshi and I were visiting Amsterdam in 2000). Of course after reading about it, I needed to try it for myself. Since I was near my favorite gourmet supermarket on Tuesday, I picked up some stroopwafels as well as two new teas. Pukka had a black spiced chai tea & BOH had an earl grey with tangerine. (Pukka also has a herbal chai and a green chai, the green chai uses green tea.) I usually make my chai with black tea and fresh spices, but was interested in seeing how a teabag type would taste. I immediately brewed a cup of coffee when I got home, and put the first waffle on top. I don't think I waited long enough because the caramel didn't get gooey. After finishing my cup of coffee and the waffle, I surfed around on the net then had dinner. Then for dessert, I brewed a cup of chai using the Pukka tea, while I was waiting for the tea to steep, I placed my other waffle on top. The waffle got so soft, it almost fell into the cup! The chai was delicious, though I think I should have steeped it for longer. I've read some blogs that Starbucks has a caramel waffle, I will have to check if ours does. p.s. I also tried the BOH earl grey, it was very citrusy and fragrant and delicious with a splash of mi lk. Recently on La Fuji Mama, she posted about a creamy pasta that is a favorite in their household. This reminded me that I hadn't made this recipe in awhile. I also had bought some Italian parsley that I wanted to use up. Since kinoko (mushrooms) are in season here, I decided to adjust the recipe to accommodate some kinoko. I lessened the amount of pancetta and added a package of shimeji (tricoloma) & a package of maitake (hen of woods). We had the pasta with some carrot salad topped with marinated onions. It was a great Sunday dinner. Saturday after a lesson, I walked to the grocery store. On my way, I passed by SOL to see if he had keema curry....nope. I debated whether to get lunch from there, but on my way back from the grocery store, I stopped to pick-up some tandoori chicken (3 drumette pieces) 300 yen (about US$3), naan 200 yen (about US$2) & chicken curry 300 yen (about US$3). The tandoori was skewered onto metal skewers then placed into the same vertical "oven" that the naan was baked in. Since I wasn't feeling too hungry, I ate 1 drumette, halved the curry and halved the naan. I think the only time I've tried tandoori chicken was at CPK (California Pizza Kitchen) and that version was really dry. The tandoori chicken at SOL was moist, tender with a little zap of spiciness....delicious. I also made some chai, using the spices I picked up in Tokyo. Lunch the next day was even better, I put the chicken and naan in the oven to warm up. The chicken got bright orangey-pink and a little burnt, the naan got crispy and the curry was delicious, it was a nice way to warm up on a cold day. Christmas is just around the corner. The economy is kind of sucky, but you still want to give your friends something small. I recently gave away some homemade vanilla extract and some taco spices. And the taco spices are a nice combination of different spices, beats the pre-packaged stuff! Just put into small jam jars, wrap up, attach a card...you're good to go!